A weekend in mid-May 2000 saw my wife Monica and I join our friends John and Brenda for a few days of desert exploration in Arizona. We (who am I trying to fool, I) chose the state's southeastern corner because of the large number of herp species in that area that I had never seen. May is a nice time of year there, warm but not blisteringly hot. May is also the best time to find Gila monsters. Unfortunately, as I discovered later, May is not the best time to find herps in general in Arizona. Live and learn. Our first stop was in Willcox, AZ. A few miles outside of town is a large swampy area known as Wilcox Playa. (Experts disagree on how many L's to put in the town and Playa's names.) Well, anyway, the wildlife viewing guide said it is swampy, and perhaps it is a bit swampy if you come at the right time of year, and in the right year. This part of Arizona has been suffering from a severe drought for years, and we spied nary a swamp. 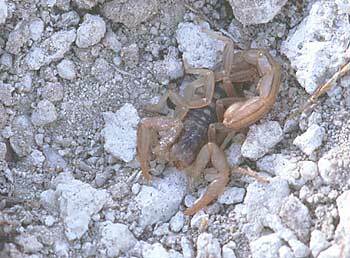 The highlights of our late afternoon visit were a few birds, this cuddly scorpion, and a handful of tree lizards. The big old cottonweed trees were nice though. The next morning we drove on to the Chiricahua National Monument, which is full of interesting big rocks.